Armkor had carried various elements of work within the cargo facility, due to the quality of the previous works carried out, the airport approached Armkor with a view to refurbishing and carrying out safety modifications to a FMC Main Deck Loader within a predefined budget. A 2-day site visit and survey was performed with meetings held with the client. The recommendations were presented to the client and a level of priority for each element of the recommendations were prioritised which were then costed. A further meeting was held to ensure that the required elements of the refurbishment were included in the works. 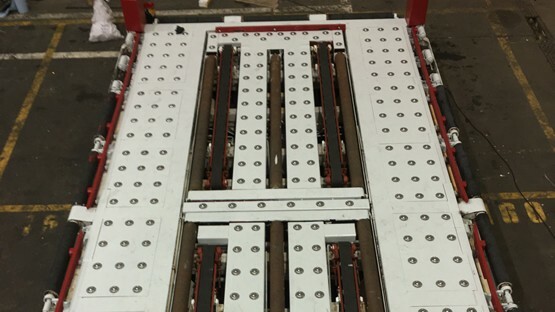 One of the main concerns was that the casters installed on the lower and upper decks were in need of being replaced due to wear and the majority had seized. This was also viewed as a trip hazard. Armkor proposed that the casters were removed and the void left was covered with steel plate. 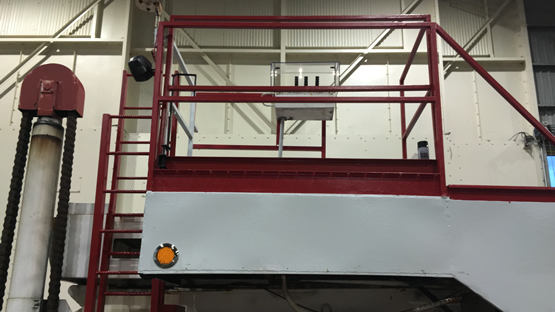 The steel plate was laser profiled to enable the installation of Stainless Steel Ball Transfer Units. Both decks were stripped of all paint, an undercoat of lead oxide was applied with two top coats. 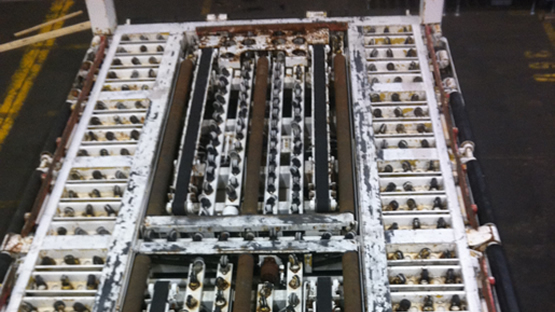 The operator’s walkway and drivers cab were extremely corroded, with the floor panel of the driver cab being in a dangerous condition. The cab and walkway were cut out. A new drivers cab was fabricated and the walkway and cab floor replace with galvanised flow forge panels. LED blinking lights were installed fitted to act as a visual warning to users on the airport apron that the MDL was in position and working. A new water tight stainless steel electrical control panel was manufactured to protect the electric from water ingress. All the hydraulic motors were tested to ensure correct working. The rear rams were removed for servicing. The rods were rehoned, new seals fitted and due to one of the rams being fitted incorrectly in the past further remedial work was required to the ram housing. The rams were refitted with great care to ensure that they were straight. During the survey some of the hydraulic houses showed to be in the preliminary stages. These hoses and fittings were replaced. From the first contact call to an engineer being on site will take no longer than an hour. The current average is 34 minutes.